They said I’ve got pronation….How long do I have doc? So you went to the “insert giant athletic store here”, and the 16 yr old kid who works part time for the summer, who is the “expert” on running watches you for about 30 seconds, and decides to tell you that you in fact, pronate. Or worse…..maybe you even over-pronate. Never fear though, they say! They’ll just go in the back and grab some of those big mutha shoes to totally stop you from pronating and be your personal savior. Before you plunk down your hard earned cash, we should probably come to terms with a few things. Can you stop it, or should you stop it? 1 – First, let’s re-cap what this pronation stuff is all about. Pronation is not bad; in fact, it’s the body’s natural shock absorption mechanism. When the foot moves into pronation, it becomes like a loose bag of bones. Everyone pronates to some extent. Some more than others. If you didn’t pronate, you’d have problems with- you guessed it- shock absorption. The opposite of pronation is supination. In supination the bones of the foot become more congruent (increased contact between the surfaces of the joints). This increased contact produces a rigid lever for push off in gait. So we should land in a supinated position, and move to a more pronated position during stance to decrease shock, and then move to a supinated position to achieve a rigid lever for push off. Let’s re-cap this again using America’s favorite national pastime, Tetris. When the pieces fall from the top of the screen, we can move them about and rotate them freely. They can move. This is how the 26 bones in your foot function in the shock absorption or pronation phase. They should move about to dissipate force. Now imagine those same Tetris pieces once you’ve placed them in the stack. They can’t move right? They become congruent and are locked in place. This is similar to the foot when you are in supination. 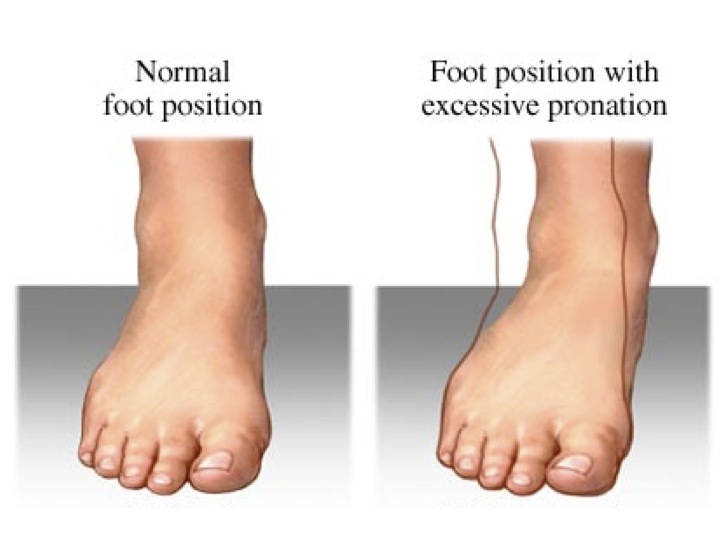 2- Now that we understand pronation as something that is not really bad; let’s talk about when it occurs. As evidenced in a study carried out in our lab and published in the Journal of Orthopedic and Sports Physical Therapy, maximum pronation of the foot occurs after the heel has left the ground. Why does this matter? Remember that 16 yr old kid? He’s going to grab a shoe off the rack that is a motion control shoe –designed or should I say marketed, to stop pronation. A shoe like this features a higher density material on the inside of the shoe. The claim is that this different density material acts to stop the pronation from taking place, thus fixing your issues. If you’d like to see if your shoe has this, just look at the inner side of the midsole (marsh mellow stuff between the fabric upper and tread). If some of the inside of the shoe is a darker color than the rest, it’s likely a “dual density midsole design”. OK – so let’s get back to timing of pronation. Shoe companies put this increased density material to “stop the foot from pronating”. Well, we found out that maximum pronation occurs after the heel is off of the ground. So guess what? – All that higher density material in the shoe isn’t even touching the ground to try and stop the foot from moving at the time when the foot is moving the most! Hmmmmm……makes you think doesn’t it? 3- We know what pronation is, and when it occurs, and now we should address the question of stopping pronation. Pronation is necessary. I’ll even say in the right amounts and at the right time, its good. I’ve seen PLENTY of runners who have problems because they don’t pronate enough. However, stopping pronation isn’t really in our best interests. 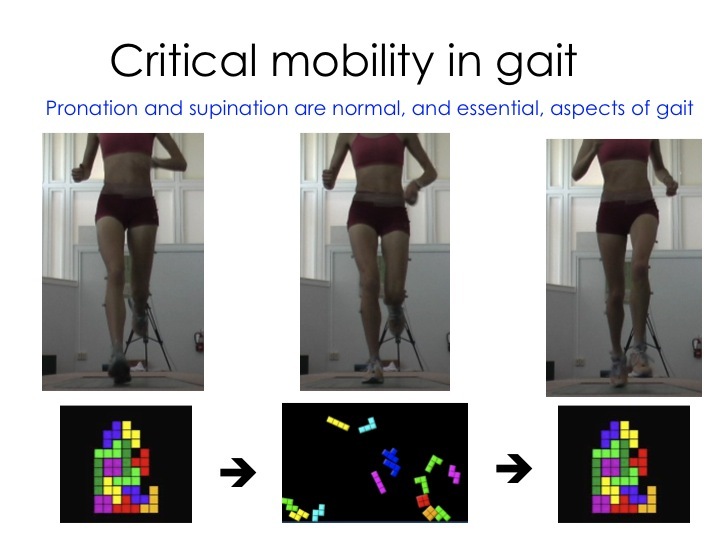 It’s better to learn to stabilize the amount of pronation. The thing is that no shoe can do this- you need to learn to use the muscles in the foot and the muscles in the hip to stabilize the rotational motion that naturally occurs in your legs. Can you do this? How good are you at stabilizing your pronation? A visit to the SPEED Clinic can help you pin point your issues and fix them for good. Parting thought –please don’t read this and think that we are saying that shoes don’t make a difference. They do. The objective research we do combined with our clinical experience has proven to us that they make a huge difference. We view footwear as part of an intervention to help you perform at your best. Shoes are very different. How much of a shoe you need, or weather you even need a shoe at all (barefoot running anyone?) are all part of a comprehensive assessment here at the University of Virginia. This entry was posted in rehab, running, Uncategorized and tagged form, injury, rehab, running, running form, speed clinic, training, triathlon on September 14, 2010 by an athlete's body. Argh! Such a potentially helpful blog post turns into an advertisement right at the key moment. An advertisement? well – yes – our mission is to help athletes succeed. This is what we do. Let’s be 100% clear on this. While most athletes want to know the quick fix exercise to correct all their faults in 1 fell swoop, it just isn’t out there! We wind up with the unique imbalances and injuries we get because of different factors in each person. The corrective exercises and drills to improve your dynamic stability in running might be a complete 180 difference form the exercises and drills needed for another runner. Bodies are different! The best way for you to find out what you need is to get evaluated for yourself. a local PT told me that max pronation can’t occur at toe off because the foot has become a rigid lever and is supinating at that point. i could not refute him. can you help?